Background: Thienopyrimidines are the bioisoster of quinazoline and unlike quinazoline exist in three isomeric forms corresponding to the three possible types annulation of thiophene to the pyrimidine ring viz thieno[2,3-d] pyrimidine, thieno[3,2-d] pyrimidine and thieno[3,4-d]pyrimidine. Heterocyclic containing the thienopyrimidinone moiety exhibits various pronounced activities such as anti-hypertensive, analgesic and anti-inflammatory, antiviral, platelet aggregation inhibitory, antiprotozoal bronchodilatory, phosphodiesterase inhibitory, antihistaminic, antipsychotic and antimicrobial activity. 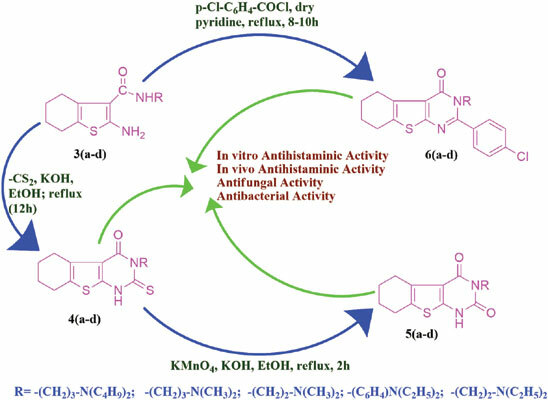 Objective: Synthesis of novel 3(N,N-dialkylamino)alkyl/phenyl substituted thieno[2,3-d]pyrimidinones as H1-anti-histaminic and antimicrobial agents. Methods: A series of 3-[(N,N-dialkylamino)alkyl/phenyl]-2-(1H)thioxo-5,6,7,8-tetrahydrobenzo(b) thieno(2,3-d)pyrimidine-4(3H)-ones[4a-d], their oxo analogous [5a-d] and 3-[(N,N-dialkylamino)alkyl]- 2-chlorophenyl-5,6,7,8-tetrahydrobenzo(b)thieno(2,3-d)pyrimidine- 4 (3H)-ones[6a-d]derivative were synthesized from 2-amino-4,5,6,7-tetrahydrobenzo(b)thiophene-3-carboxylic acid by nucleophilic substitution of different N,N-dialkyl alkylene/phenylene diamines on activated 3-acylchloride moiety followed by cyclocondensation with carbon disulfide and ethanolic potassium hydroxide to get [4a-d] and in second reaction by condensation with 4-chlorobenzoyl chloride to get [6a-d] by single pot novel innovative route. The oxo analogous [5a-d] were prepared by treating derivatives [4a-d] with potassium permagnate in ethanolic KOH. The synthesized compound were evaluated for H1-antihistaminic and antimicrobial activities. Results: All synthesized compounds exhibited significant H1-antihistaminic activity by in vitro and in vivo screening methods and data were verified analytically and statistically. The compound 4a, 4b, 5a and 5b showed significant H1-antihistaminiic activity than the reference standard chlorpheniramine maleate. The compound 6d, 6c, 5c and 4c exhibited significant antimicrobial activity. Thieno[2, 3-d]pyrimidinones, H1-antihistaminic, antibacterial activity, antifungal activity, cyclocondensation, bioisoster.